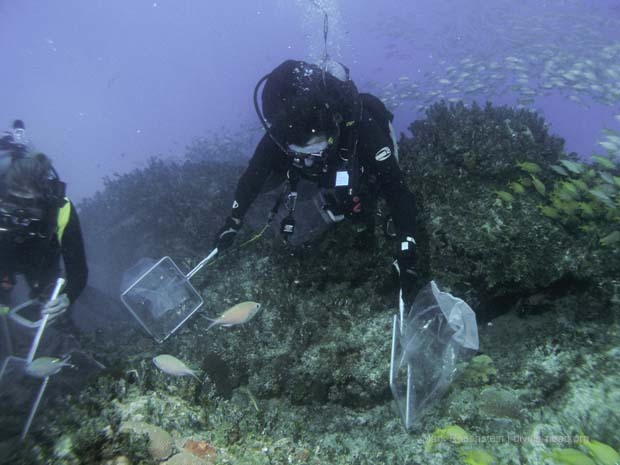 Collecting days begin at 7:00 am on the Coral Reef, in order to ensure at least three to four dives each day. On Sunday, we logged three dives, each of them very successful in terms of collecting. 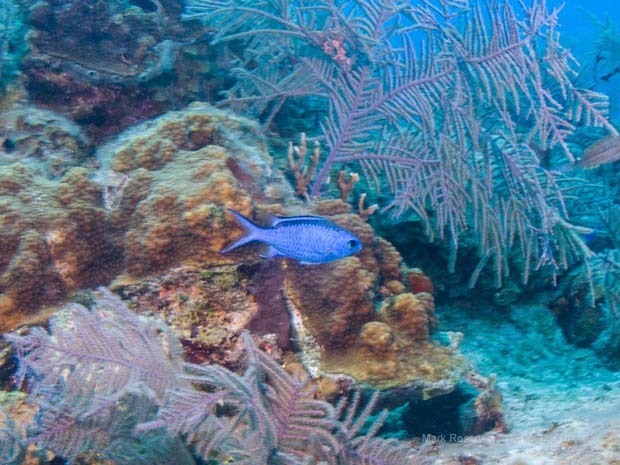 Between the first two dives of the day, the group collected 74 fish, the majority being blue and brown chromis. 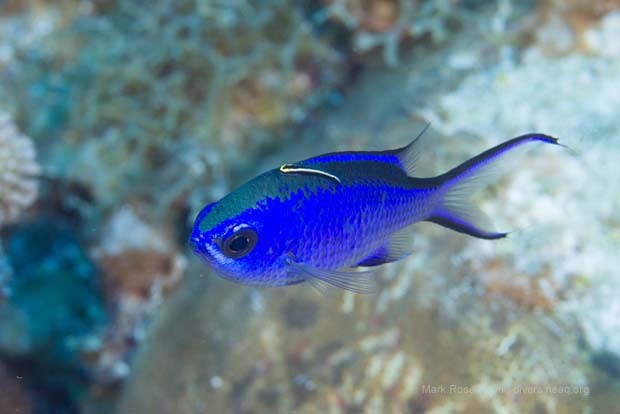 Blue chromis are a deep blue that will stand out against the colors of the reef in the Giant Ocean Tank, making these bright fish a priority on the fish wishlist. The third dive greatly increased the biodiversity of the wells, bringing up many different species of fish but in lower numbers. The porcupine fish and trumpet fish are cool additions to the Giant Ocean Tank because of their unique shape and pattern. 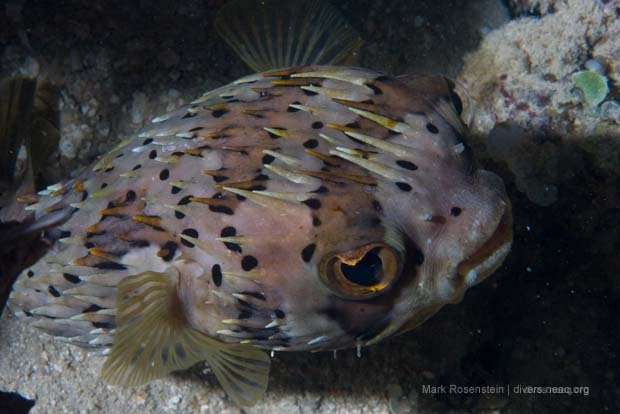 Due to their social personalities, ballonfish are favorites of the GOT divers. We hope to eventually feature them in our GOT visitor interaction program. 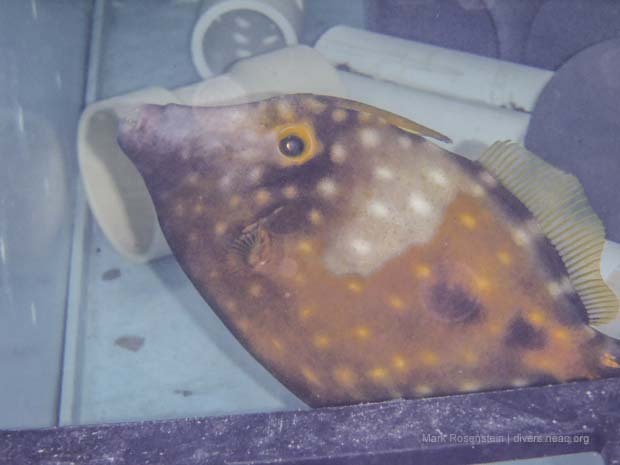 Lastly, we got our first white spotted filefish on board! The white spotted file is the fish of the trip, chosen because of their interesting color scheme and markings. They can also grow to be pretty large, a valuable trait in the new GOT. 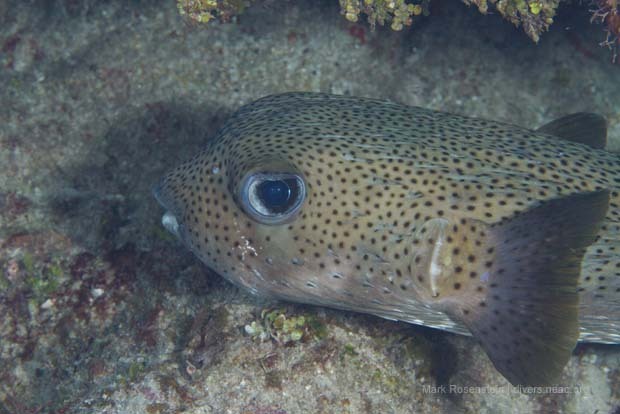 Look for these guys peering out from underneath coral overhangs. The New England Aquarium's transformation is taking place behind the scaffolding and below the water line. Follow this link to learn more about the construction happening in the Giant Ocean Tank. And here's what's happening in the temporary display, the Tropical Oceans Exhibit. It may not look like it now, but there is a lot happening in the temporary exhibit where all the GOT animals are living now. Here's a special look at life below the water line! The GOT will be home to over 100 species when it reopens early this summer! 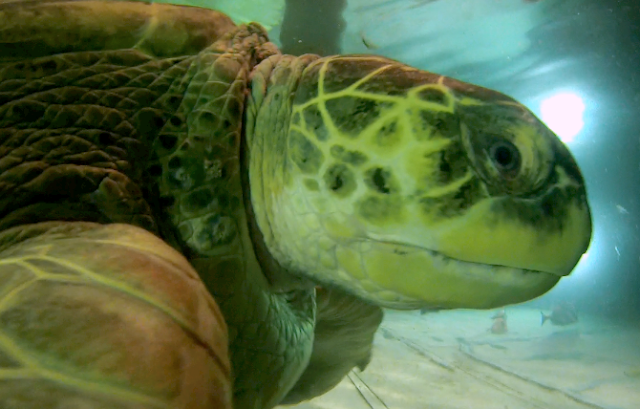 This video introduces just a few of those species—like fish in the grunts family, a short bigeye, a balloonfish, spadefishes, a queen trigger, fish in the jacks family, a sargassum trigger, a Southern stingray, and of course Myrtle, the green sea turtle, and her friend (word used lightly) Carolina, the loggerhead sea turtle. And if you look closely, you'll see some of our transport devices currently residing inside the tray in this video. Myrtle, like our marathon team runners, has been carbo loading recently to get ready for her GOT reintroduction. Stay tuned, we'll have a lot more to say about all the new animals that will join Myrtle the GOT!